Moais, also known as Easter Island Heads is the name that designates the more than 887 stone gigantic statues scattered around the Easter Island, Chile, built around 1500 A.D. 1200 A.D. by the Rapanui people. The moais can be divided into 3 categories: The first would be the Moais with carved eyes and eyelids that have a kind of hat - called Pukao made of a reddish and very porous volcanic stone, taken from the "Puna Pao" volcano, and arriving despite 12 tons. There are about 250 statues that are located on the seafront facing the island, some at a distance of about 20 km from the volcano where they were modeled. Some were placed jointly on funerary monuments called "ahu" giving rise to the theory that they would be homages to the ancestors of the island and that would serve of protection to the inhabitants. 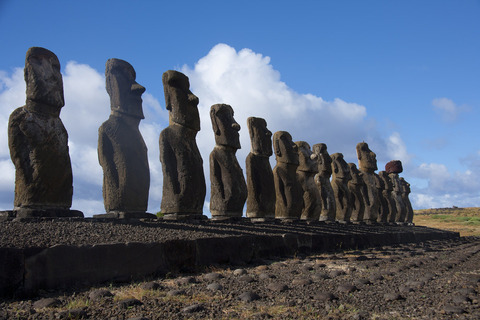 The second category would be the statues erected at the foot of the "Rano Raraku". They are statues with rich designs and inscriptions in the Rongorongo language that have been finished, but do not have the drawn eyelids and do not have the pukao hat, like the rapanui language, very similar to the Egyptian hieroglyphs, has not yet been unveiled, it is not clear what the reason differentiation between the statues and nor because they were covered with symbols. Moais on "ahu", note for the Moai with Pukao on the right. The third and most famous category would be the "tukuturi" statues, which have the peculiarity of having legs, similar in position and shape to the statues of pre-Inca art. In these, the statues are seated on the calves with arms at the side of the body and some present phallic genitalia. It is speculated that moais, whose heads bear "pukaos" - possibly representing a type of "hairstyle" used by some tribes (hair tied with a knot at the top of the head) - represent, in a stylized way, a male human torso of ears long or small representing a division of classes. Most are between 4.5 and 6 meters in length and weigh between 1 and 27 tonnes. The largest of them, however, is more than 20 meters high. According to the most consensual theory about the island, moais would have been erected by the first inhabitants, the "Rapanui", in homage to the dead leaders, which would explain the disposition in which they are, with all their backs to the sea, facing the interior of the island where the villages were.